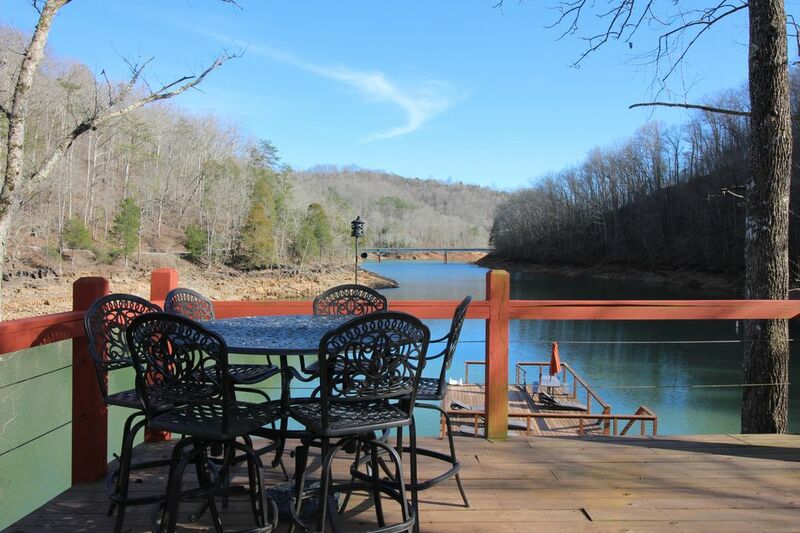 You won't find a better location on the Norris Lake for family fun! "Knopp's Landing" is a 6 bedroom, 3 1/2 bath, charming chalet that is set up for the family to enjoy. The main floor has the comforts of home and you will appreciate the lower level kitchenette, washer and dryer, and industrial ice machine. WiFi and Dish TV are provided. The sleeping arrangements comfortably accommodate 20 individuals. The loft bedroom has a queen bed. There are two upper level bedrooms. One of which has a queen bed and a bunk bed and the other has two bunk beds. Each of these bedrooms have their own vanity and share a Jack and Jill full bathroom. The main floor is the site of a master suite with a king size bed and full bathroom. On the lower level you will find a TV room, kitchenette, and wash room surrounded by two additional bedrooms and another full bath. Each of these bedrooms have a double bed and a set of bunks. The main level and lower level both have French doors leading you outside. The outside has multiple decks with spectacular views of the jumping bridge. Enjoy the hot tub, fire pit, corn hole boards, and the gentle descent to the private covered boat dock with an upper platform featuring a waterslide and jumping platform. Off the dock you will find peace as the kids can safely swim in the no wake zone and deep water. If you enjoy a jump of the jumping bridge you don't need to go far as it is in your sites. You will also enjoy the close proximity to Sugar Hollow and Shanghai marinas. Park your boat in the personal covered boat dock directly in front of your cabin. No boat? No worries! Nearby Norris Lake Watersports, Oasis Watersports, Sugar Hollow marina, Shanghai Resort offer daily/weekly boat rentals. John Bertke lives in Dayton Ohio and enjoys visiting Norris with his friends and family. He enjoys fishing and smoking cigars. He took over management of this property in early 2017. The Knopp family provides a fantastic property with a beautiful landscape and mesmerizing lake view. They say 'location' means everything. "Wake Dreams" cabin is 7 minutes from the city of Lafollette, 5 minutes from the main road, inside a gated community, right on the water's edge, and a boat ramp just around the corner. The moment I surveyed this property I knew all Norris Lake visitors would love this place. Multiple decks overlooking the lake and famous "jumping bridge"
Free access. Located 1/4 mile away up a very steep street. Private hot tub overlooking lake. We completely change the water prior to your arrival. Dock features swim platform, *slide*, lights, outlets, covered slip, outside slips. Exclusive >>>> we change the hot tub water prior to your arrival. Knopp's Landing at Norris Lake is the perfect place to gather with your friends and family with plenty of space and things to do. Cleaning fee includes bed linens and bath towels. Must be a minimum 30 years of age to rent this beautiful and well maintained cabin.